A view of the western facing entrance and tower at Christ Church, Claremont in Western Australia. 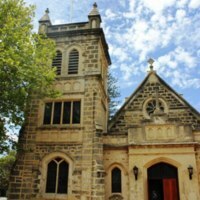 Christ Church is an Anglican Church designed by Perth architect J. J. Talbot Hobbs and built in a Gothic Revival style. The foundation stone was laid on 10 September 1892, and the original church building (consisting of the Sanctuary and the eastern four bays of the nave) was completed in February 1893. The nave was extended in 1901, and in 1909 two aisles were added. Further extensions took place in 1938 when the vestry, porch and square bell tower at the western end were completed under the supervision of architect T. W. L. Powell. At this time, the coloured lead-light rose window was also added to the western wall. The single and coupled lancet windows are characteristic of gothic architecture, as are the protruding stone buttresses and the decorative stone tracery of the blind arches, the roses above the door and the acanthus leaves at the ends of the hood mouldings. 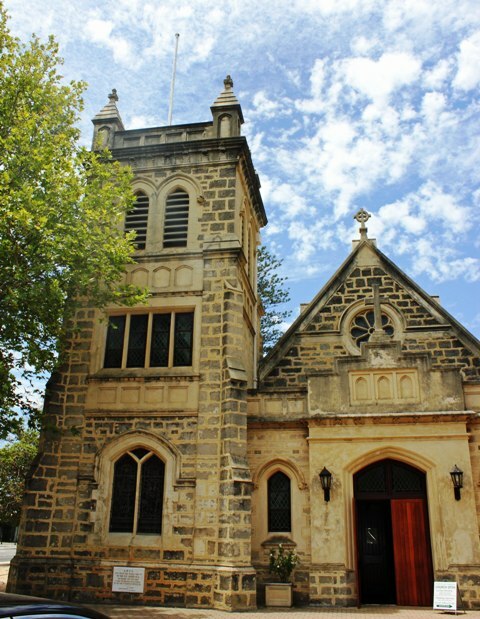 “Christ Church, Claremont, Western Australia,” Medievalism in Australian Cultural Memory, accessed April 25, 2019, http://ausmed.arts.uwa.edu.au/items/show/181.